We read of the health benefits of laughter, how it is often 'the best medicine' to relax tense muscles and reduce stress, especially during difficult times. Sharing a laugh with others - or at ourselves - results in our feeling so much better, and so much lighter! 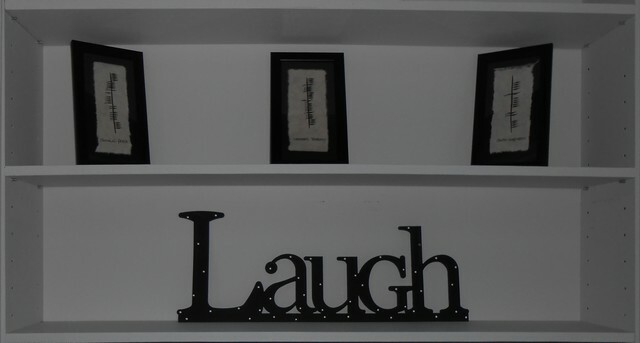 What is your 'laughter therapy'? Do you have a personal 'de-stress' kit of whimsical items, or something in your home that brings a smile? I like to watch classic comedies, such as The Odd Couple and Carol Burnett shows. John O'Donohue (author, Anam Cara - a Book of Celtic Wisdom) suggests passing a mirror and giving ourselves a wink! (I've tried it, and had to laugh at myself). I have visual reminders in my home office, such as the bookshelf in front of my computer. Above the large "Laugh", are three plaques in Ogham, an ancient Irish 1st century alphabet originally inscribed on stones, representing, Peace, Tranquility and Happiness. Would you like to share your symbolic reminders? I would love to hear about them. Thank you for joining me. Until next time... I wish you days filled with laughter!